Millions of Americans dream of owning and running their own restaurant — because they want to be their own boss, because their cooking always draws raves, or just because they love food. 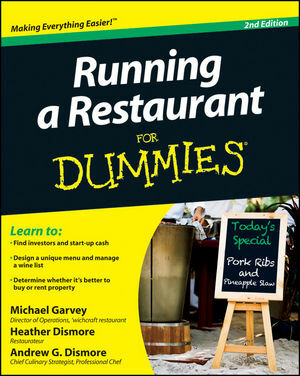 Running a Restaurant For Dummies covers every aspect of getting started for aspiring restaurateurs. From setting up a business plan and finding financing, to designing a menu and dining room, you'll find all the advice you need to start and run a successful restaurant. Even if you don't know anything about cooking or running a business, you might still have a great idea for a restaurant — and this handy guide will show you how to make your dream a reality. If you already own a restaurant, but want to see it get more successful, Running a Restaurant For Dummies offers unbeatable tips and advice for bringing in hungry customers. From start to finish, you'll learn everything you need to know to succeed. Running a Restaurant For Dummies gives you the scoop on the latest trends that chefs and restaurant operators can implement in their new or existing restaurants. Michael Garvey is Director of Operations at 'wichcraft, a division of the renowned Craft restaurant corporation. Heather Dismore is a professional writer who has extensive experience in the restaurant business. Andrew G. Dismore is an award-winning professional chef.